What is Kernel for Exchange Server Recovery? Stability: Kernel for Exchange Server Recovery is known for its stability even when there is a large volume of EDB data present that needs instant revival. It does not get shut down while plied with such a large volume. Feature for Lay Users: With this feature even a new user who has no knowledge of operating tools can operate them easily. Facilitates Offline Migration: Kernel for Exchange Server Recovery eases the recovery of EDB files even if they are offline and migrates multiple mailboxes to different destinations. Independent and Standalone Utility: It does not need any assistance from other tools in any form be it plug-ins or extensions. Saving Data in a Better Suite: Kernel for Exchange Server provides a wide platform to save the recovered EDB files to PST, Office 365, Live Exchange Server, Public folders and Archive mailboxes. Reduces PST File Size: This feature is helpful for those users who often face 2 GB truncation issue. Kernel for Exchange Server Recovery simply reduces the PST size on the basis of the pre-defined size provided by the user. Maintains Data Integrity: During the entire process of revival of damaged EDB files and their conversion to PST, the entire data integrity is maintained. This can be verified when recovered items are previewed in tree-like fashion. Many Versions Supported: Kernel for Exchange Server Recovery perfectly supports nearly all versions of MS Exchange Servers, MS Outlook, Windows OS, and Windows Server. No Special Component needed: For perfect installation, Kernel for Exchange Server Recovery needs Pentium class processor, 512 MB RAM, and minimum 500 MB free disk space to save results. Trial Version for Evaluation: Kernel for Exchange Server Recovery provides a trial version that works like the licensed version but limits its saving option to 25 items per folder in PST. With the help of this version you can evaluate the strategy used by the tool. What Problems Will Kernel for Exchange Server Recovery Solve? 1. Recalling the damaged EDB file and recovering the same: The situation became tense when system administrators were asked to take backup and Exchange failure took place suddenly. Luckily, Kernel for Exchange Server Recovery was known to one of the users. The tool was installed and EDB files that got damaged were recalled using this tool. Kernel for Exchange Server Recovery revived the EDB files even though there was no connectivity with MS Exchange Server. 3. When emails were to be retained: It was a startup company that had recently entered into construction. The department which was working with designs had some technical bottlenecks regarding emails. But the issue was resolved thanks to Susan, who had preinstalled Kernel for Exchange Server on her system. The tool provides filtering options that enable users to make use of requirement-based recovery. Using filtering options, you can include or exclude a particular item type or items falling in a date range while saving the mailbox. Companies have different needs and requirements and no software solution can be perfect in such a situation. It is useless to try to find a perfect off-the-shelf software app that meets all your business wants. The wise thing to do would be to customize the application for your special wants, worker skill levels, budget, and other aspects. For these reasons, do not hurry and pay for well-publicized leading systems. Though these may be widely used, they may not be the best fit for your particular requirements. Do your groundwork, look into each short-listed platform in detail, read a few Kernel for Exchange Server Recovery reviews, speak to the maker for clarifications, and finally choose the product that presents what you need. How Much Does Kernel for Exchange Server Recovery Cost? We realize that when you make a decision to buy IT Management Software it’s important not only to see how experts evaluate it in their reviews, but also to find out if the real people and companies that buy it are actually satisfied with the product. That’s why we’ve created our behavior-based Customer Satisfaction Algorithm™ that gathers customer reviews, comments and Kernel for Exchange Server Recovery reviews across a wide range of social media sites. The data is then presented in an easy to digest form showing how many people had positive and negative experience with Kernel for Exchange Server Recovery. With that information at hand you should be equipped to make an informed buying decision that you won’t regret. 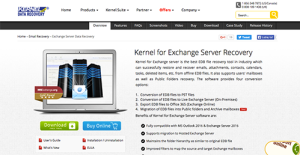 What are Kernel for Exchange Server Recovery pricing details? What integrations are available for Kernel for Exchange Server Recovery? If you need more information about Kernel for Exchange Server Recovery or you simply have a question let us know what you need and we’ll forward your request directly to the vendor.